The opening of Toy Story Land at Walt Disney World, and the announcement on Pixar Fest has been giving me MAJOR Pixar style inspo. Today I am rounding up some amazing pieces that would be perfect for a trip to the new Toy Story Land or Pixar Fest in the upcoming months. I've always loved Toy Story, let's face it I am a true 90's kid. I love anything to do with Pizza Planet, the little green aliens, or Buzz & Woody. 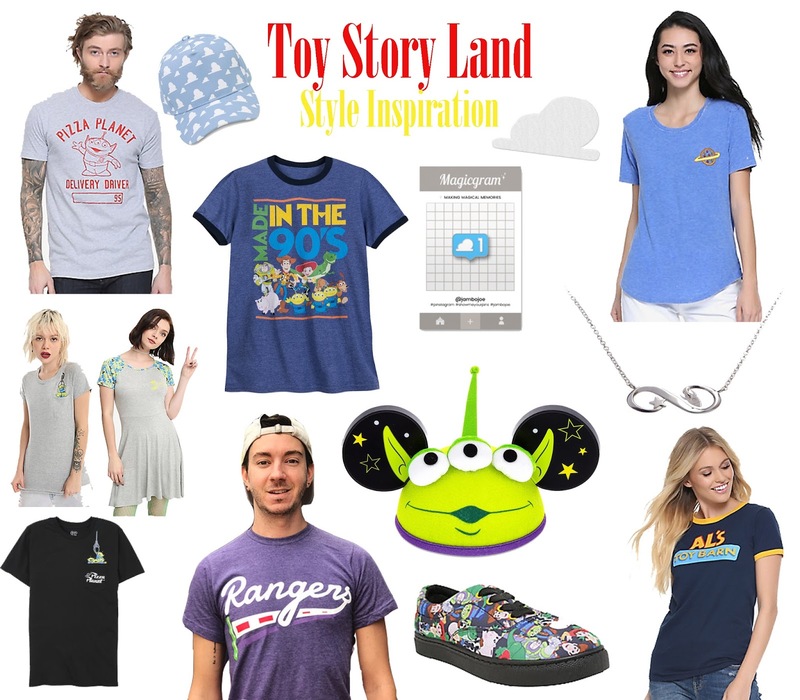 All of these pieces are super fun and could amp up your Toy Story style just in time to ride the new rides and to take tons of pics with I'm sure the new and amazing photo spots to come. I love this Alien monogram tee from Pretty Little Monograms. Sadly, she has sold out of these, but follow her page in case she re-stocks it! I'm wearing this tee and Lilly short combo to Hollywood Studios for my upcoming trip! There are so many ways to style these tees to make them your own unique style! 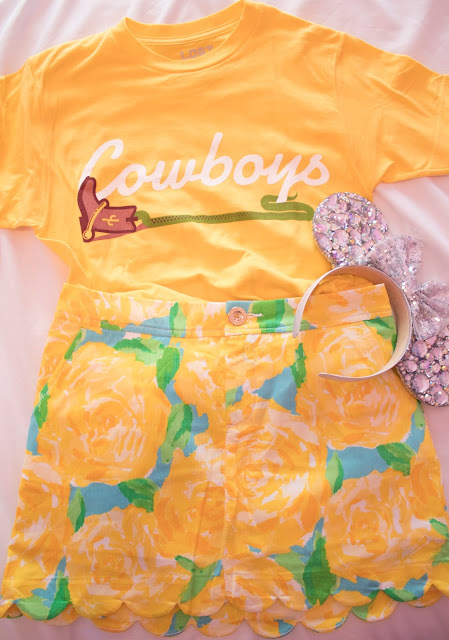 I chose to pair this Woody inspired tee with Lilly skort for a preppy look. But, you could pair it with a fun suede mini skirt, high waisted denim shorts, or even tied over a dress for a completely different look. I also love the fun little Pizza Planet mini dress that is at Hot Topic! So fun. If you're looking for a more subtle Toy Story inspired look, try out Jambo Joe's Magicgram cloud pin or his cloud patch. Pop these onto a bag, denim jacket or bottoms, or wherever you please! I love Jambo Joe's Magicgram pins and I own this cloud one myself! Other fun accessories include a fun Alien Mickey ear hat or a "To Infinity and Beyond" inspired dainty necklace. I'm also loving these Vans inspired sneakers. I luckily snagged a pair of Toy Story Vans from Nordstrom Rack before my last trip. They are super comfortable and great for the parks! Are you planning a trip to Pixar Fest or to see the new Toy Story Land this summer??? Let me know in the comments!